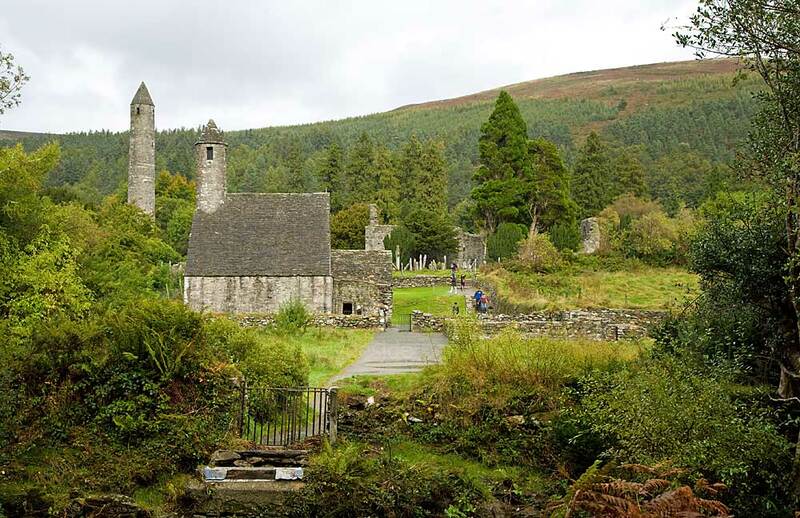 Glendalough a.k.a Gleann da Loch is a picturesque glacial valley in the Wicklow Mountains, famed for its Early Medieval monastic ruins. 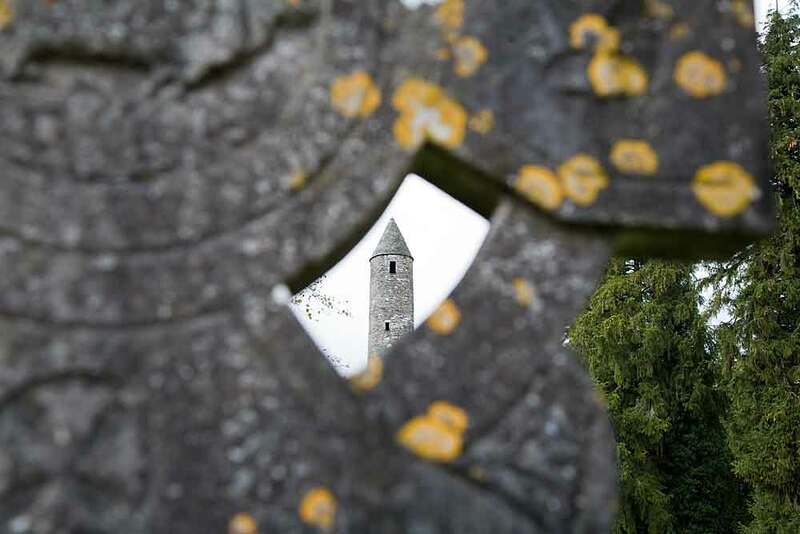 The surviving buildings date from between the 10th and 12th centuries and are the substantial remains of a settlement which was founded in the 6th century by St Kevin, a hermit priest. 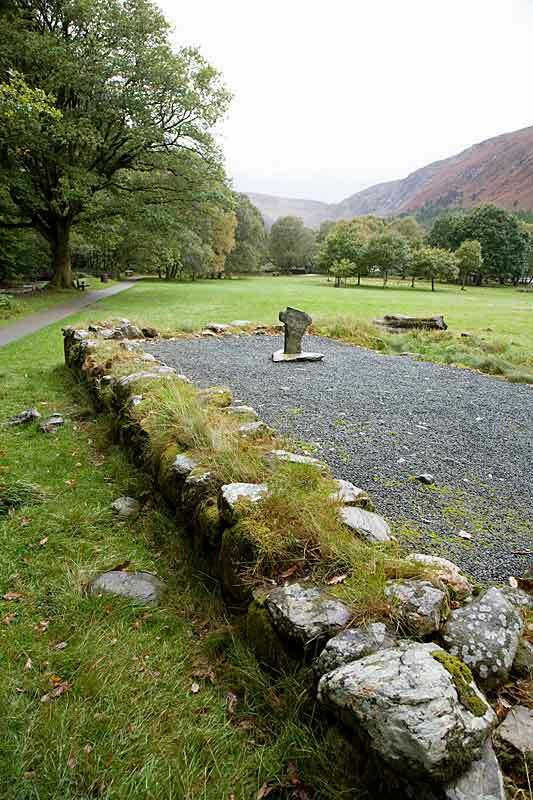 Glendalough means `Valley of the Two Lakes`. The Upper Lake, pictured above, is the finer of the two. 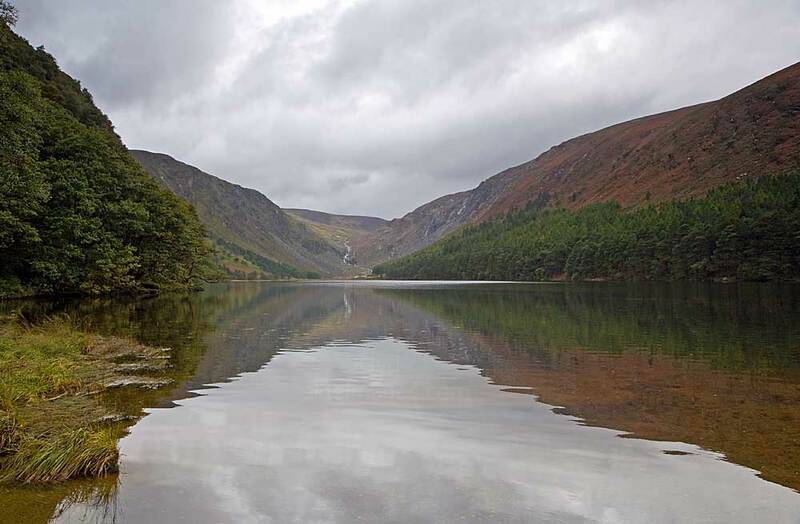 The lakes are connected by a short section of what is now the `Wicklow Way` which was formally established in 1980 making it Ireland`s first designated long-distance footpath. The route begins in Dublin and leads south-west across the rolling hills of County Wicklow to finish 130km later at Clonegall on the Wexford-Carlow border. In it`s heyday, the monastery here was famous throughout Europe as a place of learning. Within the complex there would have also been an infirmary, guest houses, workshops, farm buildings and various adjacent dwellings. 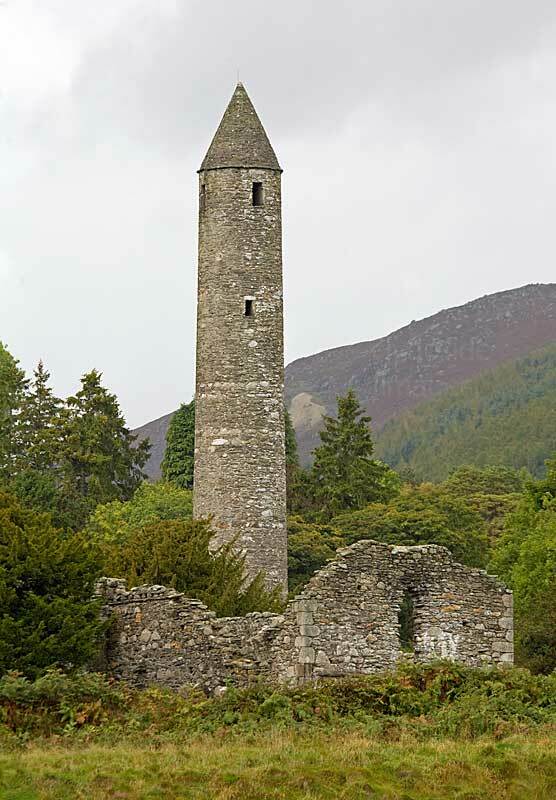 ​​The distinctive slate and granite tower at Glendalough would have originally been built as a belfry but could also serve as a place of refuge during times of attack, however, it`s defences weren`t strong enough to resist determined invaders. 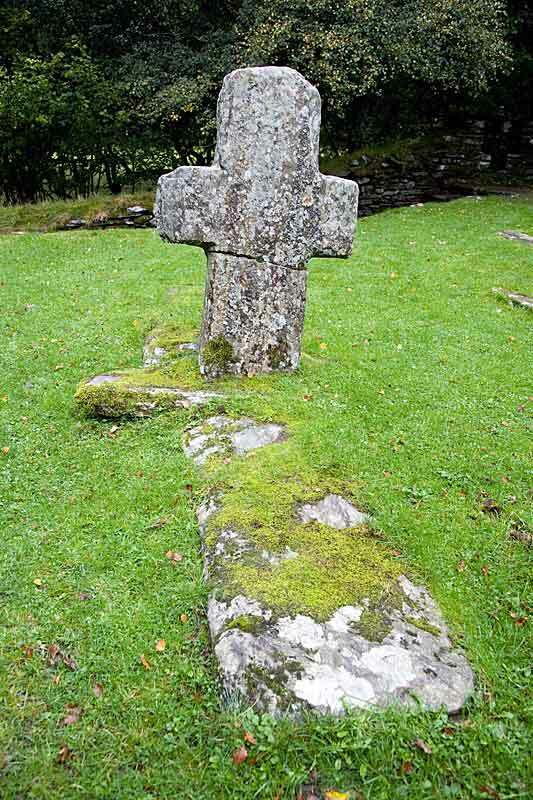 The Vikings, Normans and English all sacked the monastery at various times over the centuries. 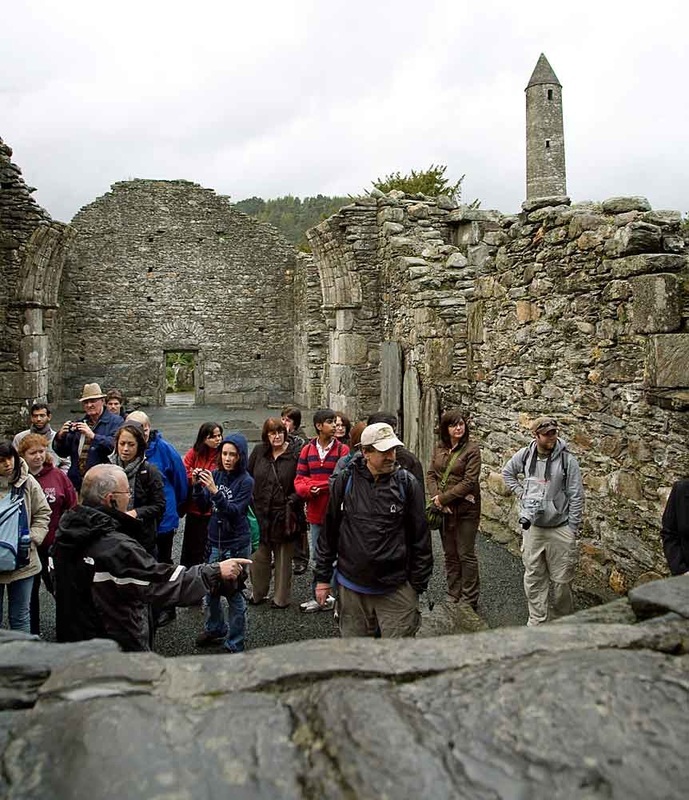 Glendalough is one of the most popular tourist attractions in Ireland and consequently the main site becomes very crowded at peak periods. It`s advisable to arrive early, before the numerous coach parties arrive, or later in the day, once the bulk of visitors have moved on. ​The Cathedral ruins are shown on the right. 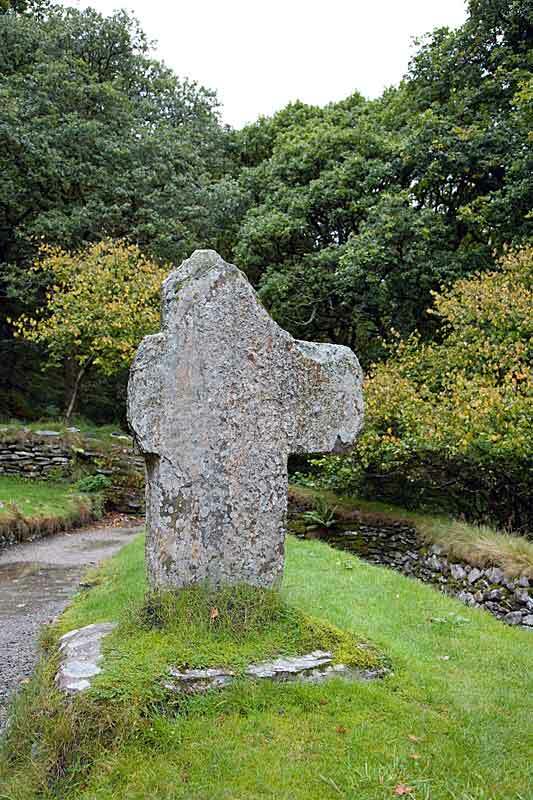 The adjacent graveyard, which has many interesting markers and carved headstones, is still in use. 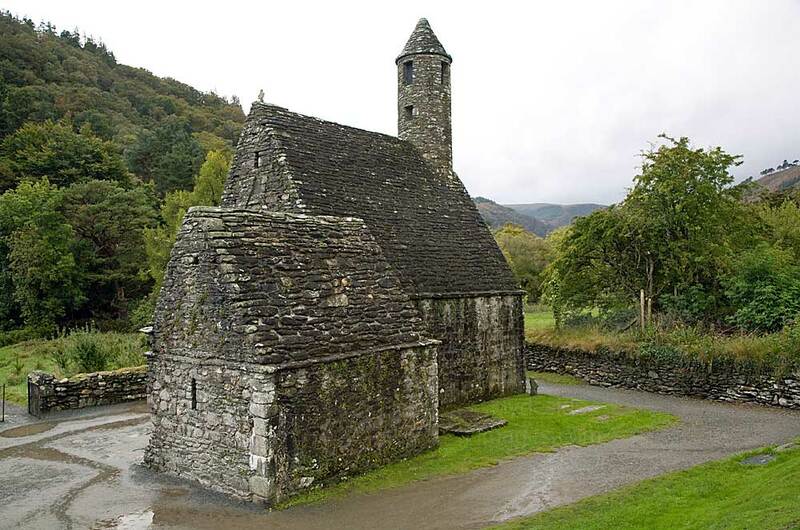 Closest to the river lies St Kevin`s Church, better known as St Kevin`s Kitchen, with its distinctive steeply pitched roof and miniature bell tower. The oldest parts of the building date from the 11th century although the structure has since been remodelled. How it became known as a kitchen is a mystery as there`s nothing to indicate that it was used for anything other than a place of worship. 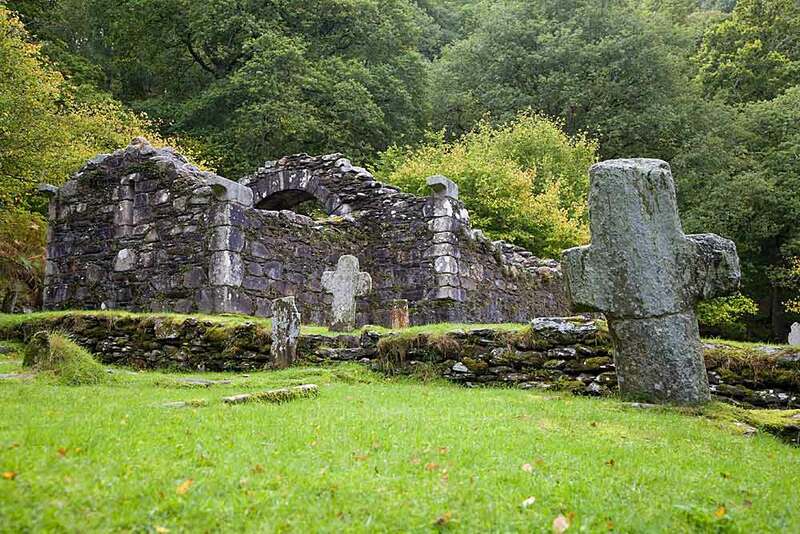 The Reefert Church is a small 11th century structure with some reassembled arches and walls. 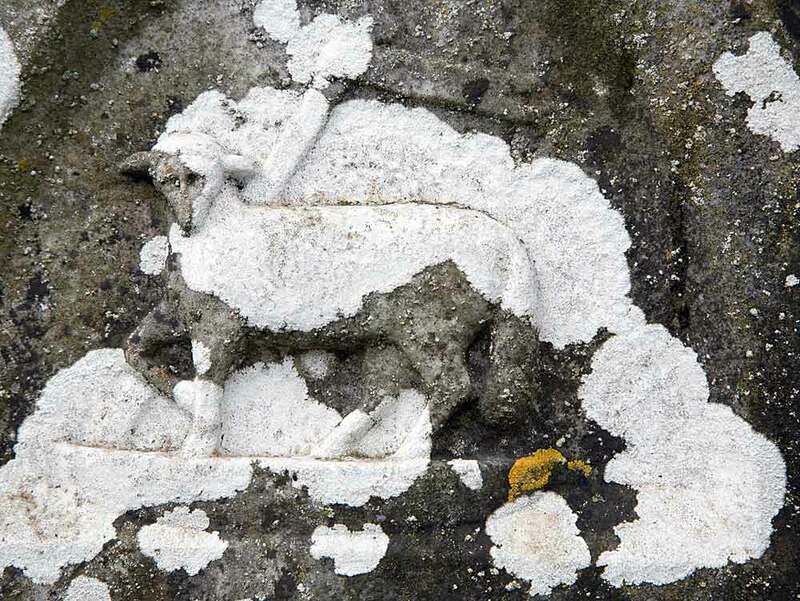 Reefert means `Royal Burial Place` and this is the last resting place of many Chieftains of the local O`Toole family. 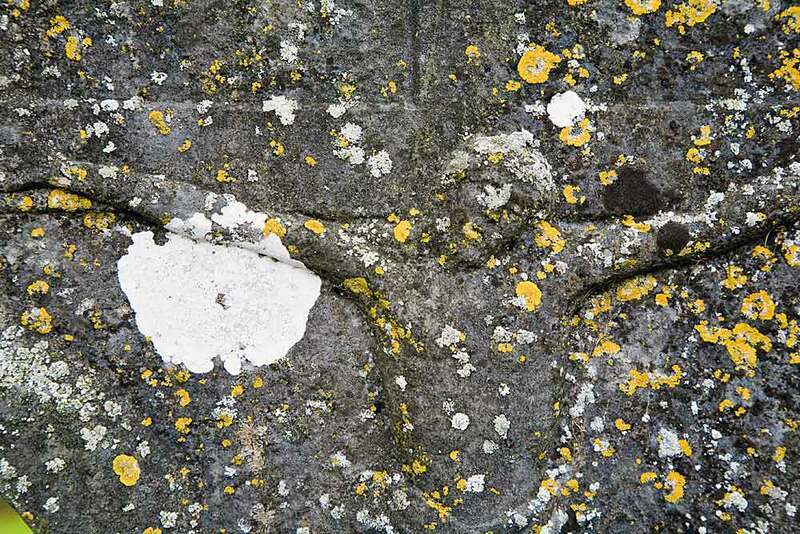 The graveyard contains a number of primitive stone crosses and badly faded slabs. Below: ​On higher ground behind the Reefert Church overlooking the Upper Lake are the scant remains of a beehive hut known as St Kevin`s Cell. 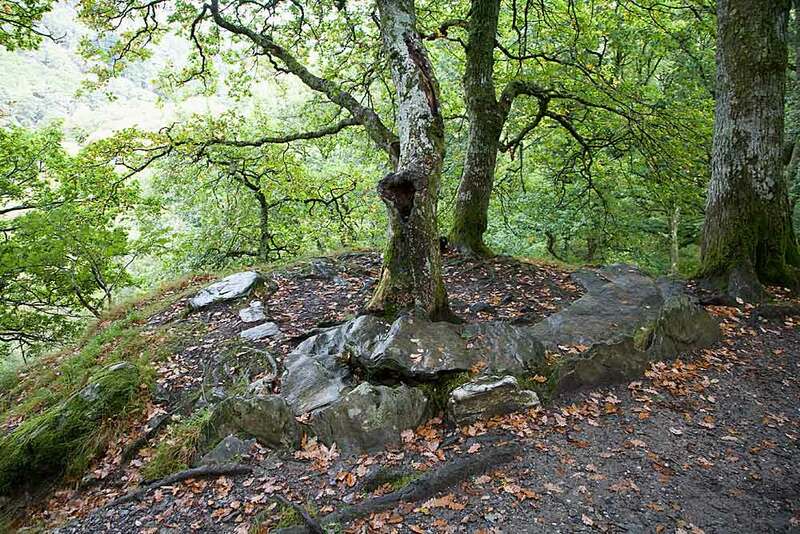 He is believed to have slept here for a time before moving to a more secluded spot, namely a cave high on the cliffs on the adjacent hillside.